This week’s Book Blogger Hop question: What is the most creative thing you have ever done with a book? I have to admit, I’m not quite sure what this question is looking for…but vagueness does open wide possibilities! Mostly, the only things I do with books are read them or keep them on my shelf 🙂 but I do have two interesting stories. Freshman year in college, I had a small TV that I wanted to put on my desk in the dorm room. Due to logistical complications, to really watch it I needed it to be about two feet higher on the desk. So I went to the school library, found eight enormous hardback books, and took them home to use as a stand. I’m not sure what the person checking the books out for me thought I was doing, considering not all of them were even in English… But they made a good temporary solution, until I could get to Office Max and buy a more proper stand! And two, a much more recent story…just last weekend there was a WizardCon convention in my city. For those not familiar, it was a convention for all things geeky, with merchandise and celebrity guests doing presentations and signing autographs. One of the guests was Billy Dee Williams, who you probably know as Lando Calrissian from Star Wars. 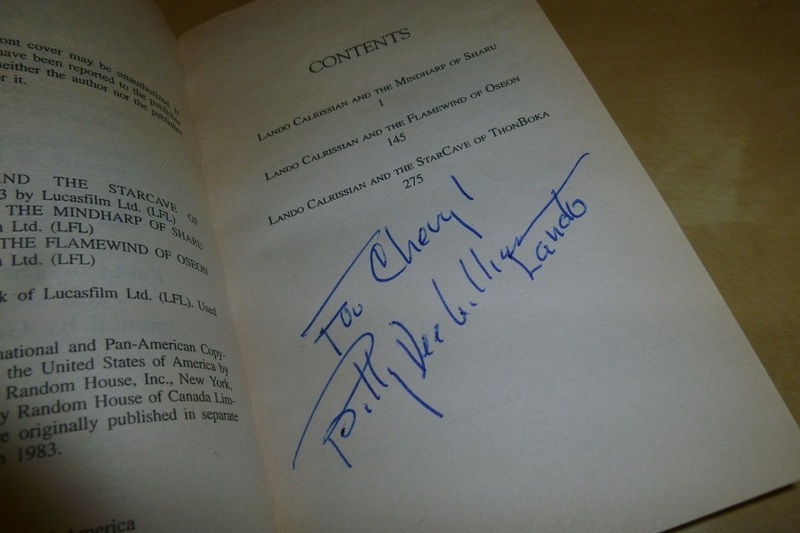 I decided that the one unique souvenir I wanted was to have my copy of The Lando Calrissian Adventures signed by Billy Dee Williams, General Calrissian himself. And I got it! I’ve totally used books to stack things up higher before. How cool that you got an autograph for your book! Good answer. Think it’s great that you get excited by geeky stuff because I do too. Have a great weekend! The old “thick book as TV or computer stand” trick is creative, but also pretty common. At my office, the receptionist has a big book under her computer monitor to bring it to the proper eye level for her. Since the book is also owned by the office, no has gone out to an office supply store to buy a proper stand as of yet, though. 🙂 Getting a personal autograph from an actor who portrayed the lead character in the book you read is pretty creative – and not a chance you would get very often, if ever. Good planning!